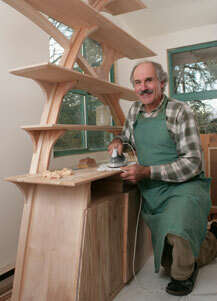 The MapleArt Custom Furniture studio is located in Maple Ridge, an hour out of Vancouver, British Columbia. It includes about 2000 square feet of working and closed storage area, which allows me to undertake large custom furniture projects in an organized way, or work on several projects simultaneously. Furnished with state-of-the-art machinery and hand tools optimized for custom orders, I can build a wide range of custom woodworking projects. Situated among towering trees and near a salmon spawning creek, my studio is the perfect place to foster creativity and craftsmanship. A wood stove burns the scraps and keeps the shop warm, sometimes it even heats a pot of Gluewein. CBC or classical music keep me company. I harvest and cut into timber myself (with appropriate help) the large majority of the maple and other local woods used by MapleArt. Only old trees or trees slated for removal are harvested. Everything is sequentially cut and stored. 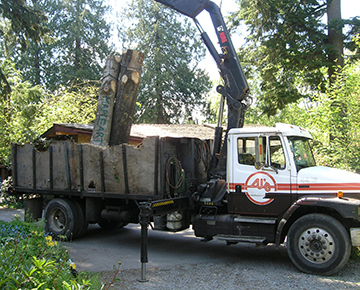 I only collect very large trees of at least 28 inches diameter to allow me to have enough wood to build entire suites or furniture groups from the wood of the same tree. Lumber is dried in my solar kiln and stored for about three years before using it. My inventory includes over 10,000 board feet of maple, beech, walnut and cherry. All boards are numbered and colour-coded to mark same-tree wood. The large amounts of shavings I produce are used in many ways: as chicken scratch, or mixed with grass clippings and leaves to make great compost. But ultimately it is not the shop by which a wood artist is judged, but by his output and joinery. 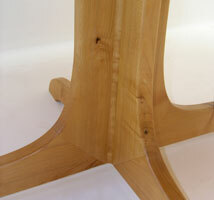 I believe that my joinery is some of the best you will see in the industry. I invite you to review the Customer Feedback page to see what my clients have said about the custom furniture I have created for them. Your furniture will be made in an environment and by using practices which can be considered to be as green and environmentally friendly as they can be. If you’re looking to have a special item of custom wood furniture created, please call me at 604-467-2287 to discuss your vision. 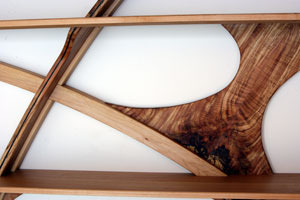 Together, we can make something unique and beautiful for your home or business.